Seventeen-year-old Colt has been sneaking out at night to meet Julia, a girl from an upper-class neighborhood unlike his own. They’ve never told anyone else about their relationship: not their family or friends, and especially not Julia’s boyfriend.When Julia dies suddenly, Colt tries to cope with her death while pretending that he never even knew her. He discovers a journal she left behind. But he is not prepared for the truths he discovers about their intense relationship, nor to pay the price for the secrets he’s kept. Goodreads. Review - Closure is a fantastic concept but I doubt that it can be truly attained. Colt's enjoying guilt and misery too much to even envision closure as a goal. 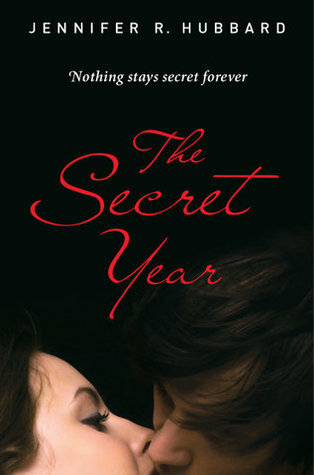 The Secret Year is an slow paced study in a year of self-examination. Nothing earth shattering really occurs, even Julia's death is eased into, but this novel is all about the small moments. Colt's inching towards acceptance and forgiveness in a relatable fashion. Hubbard keeps the scenes between Colt and Julia aloof. Whether deliberate or not, it allows the audience to see Julia more objectively than her secret lover. She's not a particularly original, nice or empathetic character. She's constantly dithering in her journal but we, like the rest of the Flats folk, never really get a glimpse inside the hours of conversation that she shared with Colt. We only have to trust Colt's word that she was worthy. At times it felt as though the relationship with Colt was part of some kind of agenda and at others, I felt that she felt really strongly for him. Regardless, her narcissistic tendencies overwhelmed both. Do I wish the journal was more forthcoming in Julia's character? Yes. But does a teen make big revelations about their psyche in their journal? No. They talk about their contradictions, their demands for the future and the minutiae of their days. While frustrating, due to the many cliched, self revalatory journal extracts we've all been spoon fed over the years, Julia's entries are genuine and real. That's what I can ultimately share about The Secret Year. It is the tale of a boy, a girl and his life post-girl. It's complex, it is subtle, it is not a wowing experience but one that will seep in. As in life, The Secret Year, washes over you. It is not one big tsunami, it is the rapid succession of smaller waves of information, revelations and confrontations that end up affecting you more. Grief doesn't stop. It can go into hiding, change forms, it can be supplanted by joy and new memories but in some way it keeps you tethered to what has been lost. Hubbard has used an interesting structure to share the perspective of our male protagonist. She intersperses his current experiences and past meanderings with Julia's entries. (Though who wouldn't read all the entries in one hit? Reading them slowly over time? Who has that much restraint?) Colt isn't particularly dynamic. He's pretty average. He's well adjusted in all facets of his life and it is fantastic to see this in a YA protagonist. He's simply a nice guy who makes mostly good decisions and will self-correct when making an error. He's a loner but he's not any of the cliches that tend to afflict YA protagonists. Everything about Colt is low key - perhaps this is the reason Julia found him so intriguing? Hubbard's style is similar - not earth shattering or obvious, instead she tells the story with an honesty and gentle introspection that makes words a non-issue. An intriguing debut, I am interested to see what Hubbard releases next. Solid storytelling with a refreshing, non-splashy approach. Adele you have totally convinced me to read this book. I have seen reviews of it some favorable , some not so much but this was a perfectly balanced.. This book was just okay for me although I am very much looking forward to Hubbard's up and coming published work. Great review, very detailed and well worded. I've read a number of reviews for this novel and it seems they are all on different ends of the spectrum, so its really nice to see a well balanced thoughtful review. It seems that even though it didn't blow you away, you still got something from the book, which is what all authors aspire to right? It's really bizare, because this morning I dug out all my old diaries from my teenage years. You know, the years where you think the world is out to get you, and no one will ever understand you. I read through some of the entires, and they don't reveal any major revalations about me as a person. They're generally filled with garble quite honestly. I can look back and laugh at my former self, but none of my entries are life changing, they're just random observations seen through a teens eyes. It seems that this is what Julia's journal was like, and this make me want to read the book even more.